If BBQ and craft beer sounds like a perfect combo to your ears, you definitely should get yourself to Herbert Park this weekend. From August 13 to 16, The Big Grill Festival in Dublin will be serving up some delicious food and beverages, made by a huge variety of skilled chefs and your favourite breweries. You might recognise DJ BBQ from such shows as the Channel 5 TV series Rad, Rad the Groms Tour (which won a BAFTA) and Jamie Oliver’s FoodTube channel. Not only this, but he has DJ’d for Microsoft gatherings, appeared in several movies and acted as presenter on Kerrang! radio. John Relihan also has connections with Jamie Oliver; John previously was head chef and pitmaster in Jamie’s flagship restaurant Barbecoa. However, he left to begin his own enterprise and this is the second year that he will be appearing at The Big Grill, showcasing the best produce that Ireland has to offer. Tyson Ho owns Arrogant Swine in Brooklyn, where he is also pitmaster. At The Big Grill, Tyson will be proudly presenting his unique speciality – North Carolina whole hog BBQ prepared the traditional way – to Ireland. Truly a feast for your tastebuds. It has to be said that Andre Lima de Luca kind of stands out on his own. Not only has he the noteworthy distinction of being the first Brazilian-certified pitmaster, he also owns Sao Paulo’s BOS BBQ – the only Texas-style BBQ house in Brazil. This is Italian-Brazilian fusion combined with traditional methods of smoking. The result is deserved global acclaim and a name that is recognised around the country. Grillstock is a much-loved BBQ house, with six branches in the UK. 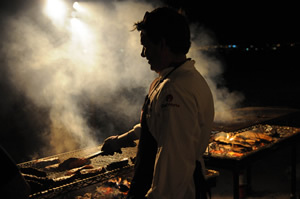 It also is host of one of the largest BBQ and music festivals in Europe. Pete Griffiths, Grillstock’s pitmaster and head of operations, will be cooking some of the best dishes on the Grillstock menu for hungry visitors. Asador is quickly earning a reputation as one of Dublin’s best BBQ houses. 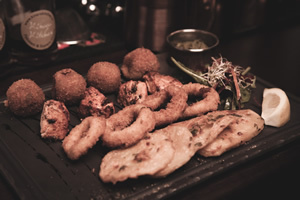 Combining top quality Irish ingredients and time-honoured methods of cooking, along with a 1.2 tonne Argentine asador (bespoke grill), you will keep returning time and time again for the mouth-watering dishes that this restaurant produces. Kinara Kitchen brings a Pakistani twist to barbecuing, with decadent chicken and lamb skewers prepared on a charcoal satay grill. Kinara Kitchen was one of the favourite food vendors at Big Grill 2014. It also won Judges Choice 2013 and People’s Choice 2014 at Electric Picnic. At this year’s Big Grill, Kinara Kitchen will have an open fire pit. Get in line. Other great eateries appearing at The Big Grill will be Smokin’ Bones, Uncle Sam’s Smokehouse, #BrewsWePlate, Adare Farm, The Pigs Tale, 147 Deli, and The Argentino Grill. Craft beer and cider will be served by Kinnegar, Franciscan Well, Porterhouse Brewing Co, Trouble Brewing, Eight Degrees, Rascals, Metalman, Brewtonic, Blacks of Kinsale, Pilsner Urquell Tank Beer, Smithwicks Blonde, Station Works, Tom Crean’s, Craigies Cider, Macivors, Dan Kelly’s Cider and Le Fevre Cider. Daily tickets will be €10 for Thursday and Friday, and €16 for Saturday and Sunday. Happy eating and drinking!